Tomato paste is a thick paste that is made by cooking tomatoes for several hours to reduce moisture, straining them to remove the seeds and skin, and cooking them again to reduce them to a thick, rich concentrate. In contrast, tomato purée which consists of tomatoes that have been boiled briefly and strained, is a liquid with a consistency between crushed tomatoes and tomato paste. It was traditionally made in parts of Sicily, southern Italy and Malta by spreading out a much-reduced tomato sauce on wooden boards. The boards are set outdoors under the hot August sun to dry the paste until it is thick enough, when scraped up, to hold together in a richly colored, dark ball. Today, this artisan product is harder to find than the industrial (much thinner) version. In the UK, paste is referred to as puree or concentrate. In the USA, tomato paste is concentrated tomato solids (no seeds or skin) and usually no added sugars or seasonings. Tomato puree has a lower solids requirement. Depending on its manufacturing conditions, tomato paste can be the basis for making ketchup or reconstituted tomato juice. Thank you so much, Elisabeth for the award. I truly appreciate it. In a large pot, heat oil over medium heat. Combine onions, peppers, garlic and salt , stirring constantly, cook until tender. Place the onions and peppers into a bowl and set aside. Into the same pot, add ground beef and sausage, turn heat to medium high and brown, cook until no longer pink, drain the grease. Place onions and peppers back into the pot, add beer, taco seasoning mix, hot chile seasoning mix, tomato paste, refried beans,chipotle cubes, tomatoes with green chiles and corn. Stir well. Reduce heat and simmer about 10 minutes. To assemble, spray a 11”x15” casserole dish with non-stick cooking spray. Place 6 corn tostadas on the bottom of the dish. Break up one tostada and use the pieces to cover the open spaces, trying to cover as much of the bottom of the dish as possible. Sprinkle some of the shredded cheese on top of the tostadas, then put a layer of meat mixture, spreading it evenly until all is covered. Top the meat with enough shredded cheese to cover. Preheat oven to 350 degrees, bake about 20 minutes until the cheese is a bubbly golden brown. Enjoy! 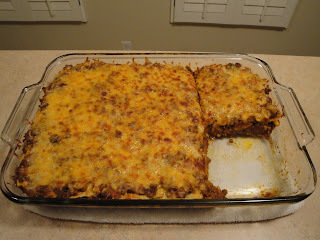 I love all of the flavors of this dish, all layered with cheese, yum! I love Mexican cuisine, it is so much safe for gluten free people. Cheesy=good, meat=good, mexican=good, having someone else cook for you=priceless! Oh my! Cheesy goodness! Looks fantastic C! Oh this sounds so good! I've never heard of green chiles & refried beans in lasagna but I'm loving it! Sounds cheesy & delicious! Thank you Liam! I hope you enjoy. I did not know that's how they made tomato paste in Sicily--interesting! 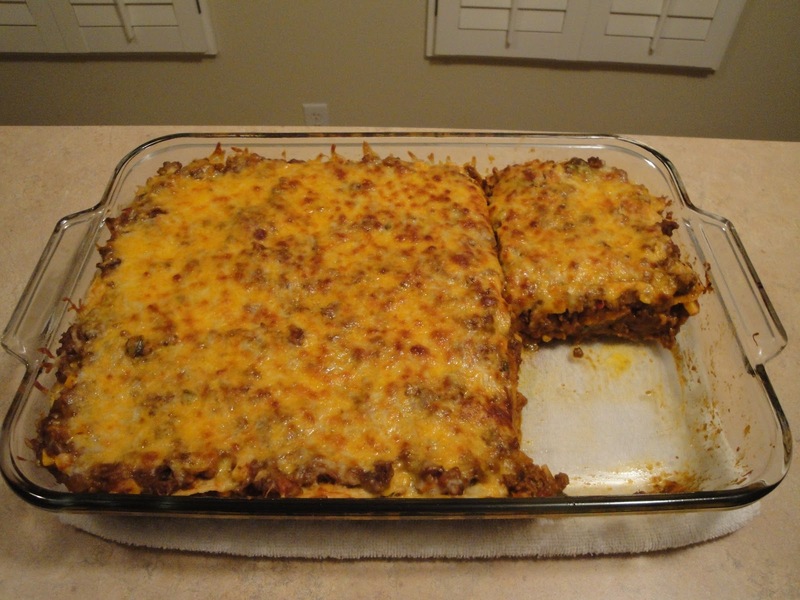 The casserole looks so hearty and filling. I love that this is "2.0". It makes you wonder what the upgrades were! You have a lot going on in this dish but, that's what cooking is all about. Good job Christine. Wow, your knowledge of food history is practically encyclopedic! Cheesy goodness with big bold flavors. Just the way I like it. Thank you Lazaro! Happy Valentine's Day! Lots of cheese and flavor. I would have had to take pictures in a hurry or this would have disappeared. So flavorful and cheesy, turned out fabulous! Love all kinds of lasagnas! And hope you're having a lovely VAlentine's DAy! 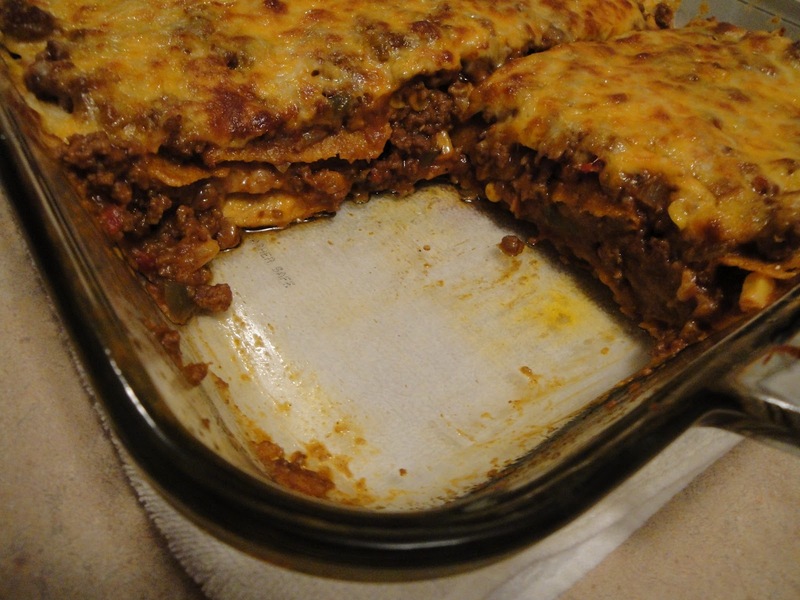 Lasagne is one of my favorites! I love your spin on it, it's a great idea! It looks so delicious, I would devour a plate of that in no time :) Hope you have a lovely Valentine's Day! I love the flavor combination in this dish. I love this combination! Sounds like a perfect weeknight meal.